As my husband would say....."I've been as busy as a cat in a room full of rocking chairs." This time of the year is always busy and to add to it, we are trying to finish a bathroom remodel before next Friday. My daughter and her honey are coming for a visit and I'm hoping the guest bathroom is ready. The last time we did a face lift, my husband was off on a hunting trip with the boys and my daughter and I decided to wall paper, replace a light and paint. It was fun and a memory for sure. I hate to tell you how long ago that was....Lets just say more than 10 years. It will be a beautiful room when complete....and I CAN'T WAIT! The November card class at PSB http://paradisescrapbookboutique.typepad.com/ was sold out. We did two Christmas Easel cards. Everyone did a great job, I'm proud of them. It was fun to watch the facial expressions and then the smiles as the projects were completed. I've heard from several of the girls and they are creating the cards at home. That is, after all, the purpose of teaching. I'm very proud of those who are creating on their own. I can't wait to see what they've made. I took my camera....but guess what....I forgot to take any photos. Next time... I promise. For December, I decided to create two birthday cards. It seems I'm always behind the 8 ball when it comes to birthdays. (I have 8 cards to make for December and January...goodness!) The first card is a shaker card. I always enjoyed making them and I thought maybe the girls would have a good time too. The second is an easel card. I patterned this one after a card I made for my daughter-in-law. Both cards were fun to make and I'm sure the gang will enjoy making them. Mary! As usual these cards are wonderful! 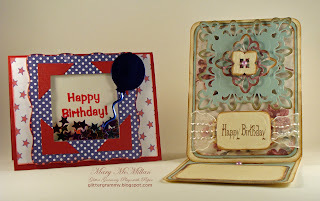 I am loving your easel cards and this shaker card is cool too! Isn't it nice to have cards made in advance? I wanted to let you know that I have given you three awards! You can pick them up from my blog! Have a great Sunday! Your Easel card is just stunning! Love all the fantastic touches you added to give it that extra pop and elegance! The one with the balloon is soooo cute! I love the little stars in the shaker part. You're cards are amazing!